The century that began in 1914 with the outbreak of the First World War was catastrophic. 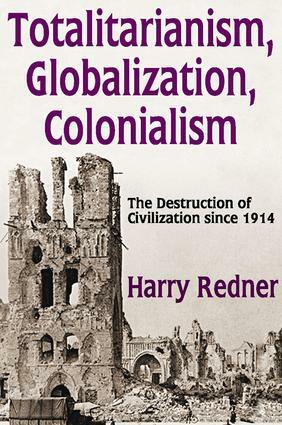 Over the course of that one-hundred-year span, civilizations were destroyed in the Old World, the New World, and the Third World, the latter represented by China, India, and Islam.In Europe the main agent of destruction was totalitarianism; in America it was globalization, ushered in by modernity; and in the non-Western world it was colonialism, followed later by totalitarianism and globalization. Harry Redner examines each of these processes, providing theoretical and historical accounts of their emergence. He considers the effects of Nazism and Bolshevism on the morale and morals of Europe; studies the effects on the United States of the nation's emergence as a major world power; and describes the impact of modernization on China, India, and Islam as they underwent Europeanization, Sovietization, and Americanization.Redner confronts us with a paradox: in the midst of unprecedented material affluence and organizational efficiency, one that uses advanced technologies and cutting-edge scientific knowledge, we are also sinking into an unprecedented cultural, moral, intellectual, and spiritual decline. He locates the origins of this condition in the violently contradictory processes of the twentieth century.